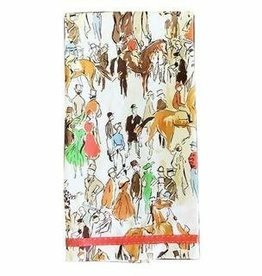 Home / Paddock Tablecloth 55"x55"
Our equestrian-themed Paddock Tablecloth features a hand-drawn scene from a vintage race day, capturing the thoroughbred horses, determined jockeys, elegant ladies and dapper spectators as they gather before the big event. 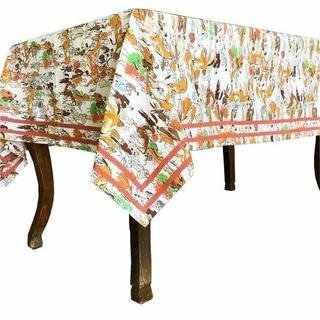 A tasteful design in hues of orange and coral, this tablecloth is finished with matching coral ribbon trim. Bursting with vintage racing vibes, out Paddock Tea Towels make for a fun and functional addition to your kitchen. 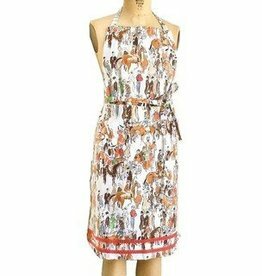 These cotton hand towels were inspired by the races of yesteryear, with hand-drawn elements that mimic the one-of-a-kind look of watercolor. 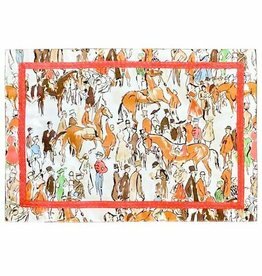 Featuring a bold equestrian pattern in beautiful oranges and corals, our Paddock Placemats create a striking foundation for any table display. 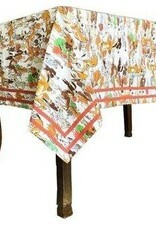 The bright ribbon trim with contrasting stitch adds a polished punch to these unique cotton placemats.